You know what makes a great book? Authors who aren’t afraid to get dirty; authors who don’t hold back on tragedy. This is especially true in adventure books — if your characters are frequently put in dangerous situations, bad things should happen. Yes, maybe they’re able to get out of those bad situations and rise above it, but it shouldn’t be easy for them. D.J. MacHale is one author who definitely doesn’t hold back and definitely doesn’t make it easy for his characters in the final battle. I am very satisfied with the conclusion of this series. All the characters showed tremendous growth and the final battle was pretty awesome. MacHale did some careful planning with this series, because I noticed things that tied back to clues given in previous books, which was fun. This is the point I was waiting for throughout the entire series, and like I said, MacHale doesn’t hold back. The stakes are high and it gets dangerous for Bobby and his friends. The only thing I didn’t like was the explanation of what makes them all Travelers and how the gates were formed. I know it’s a fantasy/science fiction novel, but it was just a little too far-fetched for me. I’m not going to go into detail due to spoilers, I’ll just say that I think there could be far better explanations to the one MacHale chose. However, this was a satisfying ending. It got kind of shaky for me around book 6 (The Rivers of Zadaa), but I continued with it because I was invested in the characters by that point. Around book 8 (The Pilgrims of Rayne), I was feeling it again, and now I’m glad I stuck with it. 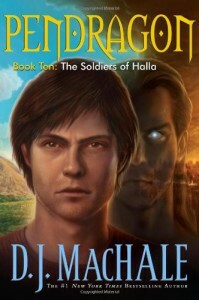 Soldiers of Halla is a great book full of excitement, danger, adventure, friendship, and everything that I love about the Pendragon series. Honestly, I think it’s the best book of the series because the stakes are raised so high and the characters really have to struggle. I recommend this entire series to lovers of young adult adventure/fantasy. They’re imaginative, exciting books that don’t disappoint.